Amazon has begun selling physical books published by Macmillan again, suggesting the beginning of a resolution in the battle over ebook pricing between the publisher and the retailer. It all began a week and a half ago, when Macmillan, whose imprints include Farrar, Straus and Giroux, and Henry Holt and Co., demanded that Amazon charged more than the standard $9.99 for its titles that were sold as ebook titles for the Kindle reader. Macmillan wanted more control over the prices charged. Amazon responded by suspending all Macmillan ebook titles from sale, and followed that up a week ago by removing all Macmillan titles from its site – something that was bound to have an impact, since Amazon is the world's largest book retailer. Now that the dust has settled and tempers have cooled a little, Amazon has begun re-selling Macmillan titles. Macmillan ebooks are still not available, though, and the Amazon site is displaying a message for those want electronic versions: "Tell the publisher! I'd like to read this book on the Kindle." Macmillan wants to be able to charge $12.99 to $14.99 for its ebook titles. 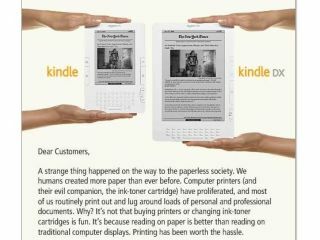 Other publishers have also complained about the low prices Amazon is charging for ebooks. In a letter to authors, Macmillan Sargent wrote: "I want to assure you that Amazon has been working very, very hard and always in good faith to find a way forward with us." Quite whose way that will be remains to be seen.